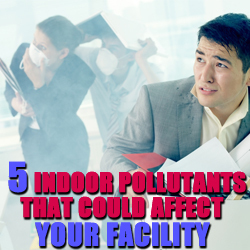 Indoor air pollutants inside of an office building or workplace is a problem for full-time employees, facility managers, and customers just visiting the building as well. The indoor air quality (IAQ) of a facility is something you shouldn’t take for granted — everyone deserves to live and work in a healthy environment at all times and should be aware of any pollutants that may be present in the spaces they occupy most. 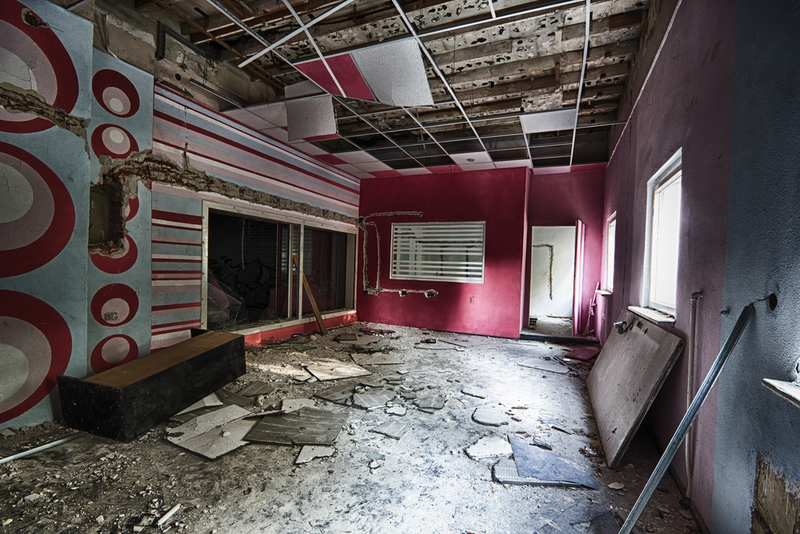 Don’t let mold wreak havoc on your office space. Mold is the mother of all indoor pollutants because it is often invisible to the naked eye and it can negatively affect a facility or workplace in so many different ways. First of all, toxic mold can cause health problems in those exposed to it: employees, customers, facility managers. The elderly, infants, and those with compromised immune systems are at greatest risk for health problems that may include itchy eyes, coughing, sneezing, skin rashes, headaches, and fatigue. In extreme cases, mold spores can even cause respiratory issues, including wheezing and asthma. On top of affecting your health, mold can cause damage to the facility itself. This is due to the fact that mold thrives on porous materials like wood, carpet, drywall, insulation, and tile that make up much of the structure of buildings. The longer mold is allowed to grow, the more it will eat away at the structural integrity of your building. If you’re a facility manager or own a building, it’s important that you follow all codes and make sure the indoor air is mold-free and safe to breathe. Both of these problems are exacerbated by the fact that mold thrives in damp and dark places that are often hidden, such as attics, crawl spaces, basements, behind walls, in ceilings, underneath sinks and appliances, beneath the carpet, and just about anywhere else that moisture has the ability to accumulate. Mold is often lurking behind the scenes, releasing toxic spores that when inhaled, can produce some of the symptoms mentioned above. Due to this fact, it’s that much more important for facility managers to schedule regular mold inspections with certified mold specialists like 911 Restoration. Much like exposure to toxic mold, dust and other indoor allergens in an enclosed work space can lead to uncomfortable allergy symptoms such as sneezing, coughing, and itchy eyes. If you find yourself experiencing any of these symptoms while at work, you may be inhaling dust particles or other indoor allergens. Luckily, there are some solutions. While you can’t get rid of all of the dust, dirt, and debris inside of your building or office space, there are some simple things you can do to lessen the impact indoor allergens have on you and your health. By simply cleaning around your work area on a regular basis (just wipe down surfaces with a wet rag) and vacuuming, you can rid your personal workplace of most unwanted dust. It’s also a good idea to keep a tissue box near your dust, as well as allergy medication in case of a health emergency. 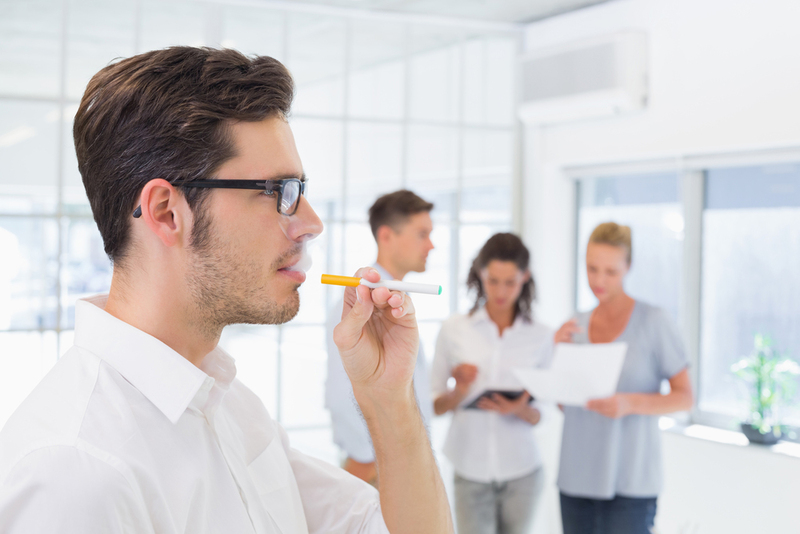 Smoking is the most common indoor pollutant that affects workplaces. Work facilities are frequently polluted by different types of smoke that can be harmful to both employees and patrons alike. Cigarette smoke is the most common type of smoke found on a daily basis in buildings, often irritating the eyes, nose, skin, and throats of anyone near the person or persons doing the smoking. Even worse, smoke tends to linger in the air well after a cigarette has been extinguished, leaving behind an unpleasant odor and potential secondhand smoke fumes for customers and employees to inhale. If you work at an industrial plant, work with coal or chemicals, or have a job outdoors in a highly polluted city like Los Angeles or Pittsburgh, you might be exposed to all different types of smoke that can negatively affect your health. Additionally, although rare, your workplace could experience a catastrophic disaster such as a fire, explosion, or gas leak that could produce potentially harmful or even fatal smoke. In both cases, it’s important for building managers & maintenance personnel to regularly check smoke alarms and take other proper fire safety precautions. While it’s not typical to be around pesticides in a workplace setting, it’s still nice to be aware of these potentially dangerous chemicals in case you are exposed to them, even in limited quantities. Pesticides are more likely to be present if you work outside or have an office that has many large indoor plants throughout the building. If that’s the case, there’s a good chance that these gardens are maintained by some sort of gardening crew. If you know you’re sensitive to pesticides, it may be worth talking to a facility manager at the building or the landscaper themselves. One of them should be able to tell you what types of pesticides are being used at the facility, if any. Pesticides are toxic so if you’re exposed to them in large quantities it’s best to nip a problem in the bud before it gets any worse. A headache at work could be a sign of exposure to harsh chemicals. The last indoor pollutants you want to watch out for are cleaning agents and the chemicals they let off. Depending on who cleans your office, these cleaning agents could be used by the janitorial staff, an after-hours cleaning crew, or general building staff. While cleaning is essential to a clean work environment, it’s important to know the chemicals present in any cleaning agents used at your office, especially if the cleaning is done while you’re at work. Many everyday cleaning products are riddled with harsh chemicals that can irritate your skin and affect your breathing. These side effects are felt most often when the chemicals are used in enclosed areas, where the toxins can be easily inhaled, or when certain cleaning agents are handled without proper protective gear. If you’re in a work environment where you’re exposed to chemicals from cleaning agents, speak to management about providing you with protective gear like a face mask. In general, try to avoid areas being cleaned as much as possible. Indoor air quality issues affect employees, patrons, and building management alike so while the onus is on facility managers and other maintenance officials to ensure safe breathing air, it’s important for everyone to be aware of what the dangers are and how to potentially combat indoor air pollutants like dust, mold, and smoke should they be present in the building or office space.